If all of your blood vessels were laid end-to-end, they would extend for about 60,000 miles. Supplements for Strength-Power Athletes is a handbook of short monographs on various dietary and sports supplements. The book is intended for serious athletes. The authors (Antonio and Stout) also published Supplements for Endurance Athletes (see separate review); both of these handbooks follow a similar format. 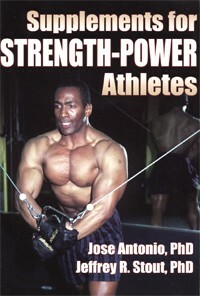 • Jose Antonio earned his PhD in muscle physiology from the University of Texas Southwestern Medical Center in Dallas. His research interests include muscle growth, androgen metabolism, and sports nutrition. At the time this book was published, he was a senior manager in sports science for Nutricia. • Jeffrey Stout earned his PhD in exercise physiology from the University of Nebraska. His research interests include sports nutrition, muscle fatigue, and body composition. As mentioned, this 149-page book is essentially a collection of monographs on 24 single-ingredient and 6 multi-ingredient dietary and sports supplements that serious athletes might use, or consider, to improve their competitive performance. It's not clear how or why they selected the 6 multi-ingredient products included here. This should have been explained, considering there are literally thousands of sports supplements on the market. In each monograph, the authors do a good job of summarizing scientific evidence and delivering it in a manner that makes for easy reading...ie., it is written in consumer-friendly language. Yet, when discussing specific studies, they cite the original paper and these citations (there are 191) are listed at the end of the book. The authors admit that, for some supplements, there just isn't much research available. For these supplements, obviously, the monograph is short. However, for creatine, a supplement that has been researched extensively, the monograph is still only 5 pages long. When this handbook is compared to its companion, you find that some supplements are discussed in both books. However, the monographs are not identical. For example, the monograph for creatine is 5 pages long in the book for endurance athletes, but it's 9 pages long in the strength-power book. The authors have obviously tried to slant the monograph to the specific audience. Most of the monographs contain figures and graphs to enhance the discussion of the research. Black and white photos are used liberally. Supplements for Strength-Power Athletes is a handy reference for the serious athlete who wants to fine-tune his/her sports nutrition plan. Copyright (c)2006 AthleteInMe, LLC. All rights reserved.